Tiger’s Milk and Tiger Nuts, Oh My! Before “Tiger’s Milk” became famous as a punch line in a Woody Allen movie*, it was the iconic “health food” of my youth, one of the most popular items in what were then known as “health food stores”. Originally invented in the 60’s, Tiger’s Milk Bars were called “America’s original nutrition bar”—and continue to be widely available in various sizes and flavors. Given that I used to love Tiger’s Milk Bars, I was naturally curious when I recently came across a snack food intriguingly labeled Tiger Nuts. What are tiger nuts, you ask? First, they’re not a nut. Technically, they’re a tuber of a grass-like plant known as the yellow nutsedge. Tubers are basically structures that grow on a plant– usually on the root, sometimes on the stem– that serve as a kind of storage unit for nutrients. The tuber vegetable family includes yams, sweet potatoes, jicama, taro and Jerusalem artichokes. Second, they’re not that new. 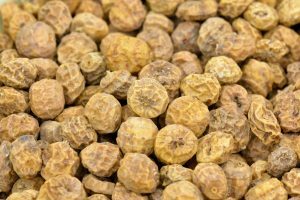 According to an article in London’s Daily Mail, Tiger Nuts were a popular treat during the 1950’s and 1960’s but are now making a comeback as a superfood, due to their rich nutrient profile and their amazing amount of fiber (more on that in a moment). Are they a superfood? It’s easy to argue “yes”. They have a rich content of minerals like phosphorus and potassium and magnesium, and are a natural whole food source of iron. But the very best thing about them is their fiber content. A mere one-ounce of tiger nuts has an almost unheard of 10 grams of fiber, which puts fiber “poseurs” like bread and cereal to shame. What’s more, much of that fiber is known as resistant starch, a type of fiber that helps maintain a healthy balance of gut flora. There are studies showing that resistant starch improves insulin sensitivity, which in turn, helps with losing weight. Prevention magazine even suggested that resistant starch may well be the “next big thing” in weight loss. The fiber in Tiger Nuts is actually prebiotic fiber. Prebiotics are food for the good bacteria (probiotics) in your gut. This is hugely important, since it’s becoming increasingly clear that the care and feeding of the “good guys” in your gut microbiome is of critical importance to your overall health. (It’s also important for your weight, by the way). So how do they taste? Not at all bad, especially for a snack this nutritious. The brand I sampled (manufactured by a company called Organic Gemini) had a slightly nutty, slightly sweet taste. One good thing about them is that because they have so much fiber, they take a long time to chew, so they last a long time and feel very satisfying as a television or movie snack (and they beat the pants of popcorn from a nutritional point of view). Soaking in water can also soften them, and creative folks will find all kinds of ways to use them in baking. You can also make (or buy) Tiger Nut flour, which would be a great alternative to wheat. I’m giving Tiger Nuts a big thumbs up. Apparently, they’re easy to find—I found at least four different brands online, and you can easily buy them from Amazon. I think you should try them. If nothing else, they’re one of the best sources of fiber I’ve found in a long time. Dr. Melik: This morning, for breakfast, he requested something called “wheat germ, organic honey, and tiger’s milk”. Dr. Aragon (chuckling): Oh, yes. Those are the charmed substances that some years ago were thought to contain life-preserving properties. Coffee — Health Benefits or Hype?